A big asset for many, it's worth looking after your new road bike to ensure it performs well and is safe to ride at all times. Below are periodic maintenance suggestions and basic checks to make prior to riding your bike. Detailed maintenance suggestions tailored to your bike can be found in the owner's manual/handbook supplied with your bike. Please read your owner's manual before riding your bike. It's full of useful tips and will guide you through adjusting the brakes to your personal preference as well as advise you on how to avoid problems with your bike. Ensure your tyres are inflated to the suggested pressure (pressure guide is on the tyre sidewall) and that the tyre is not torn. Test your brakes. Do not ride your bike if both brake pads do not contact the rim or disc adequately. Adjust your brakes as per the manual if required. Check that wheels are secure and there is no play. Tighten the quick release or thru-axle if required. Fully clean, degrease and lubricate your drivetrain. This will lower pedalling noise and prevent any premature wear. The drivetrain includes chain rings, cranks, cassette and chain. Tighten all bolts to the suggested torque levels as stated in the owner's manual. Start from the front of the bike and work your way to the rear. While doing this, check for play in the parts & components, in particular the headset, bottom bracket and rear suspension linkage if applicable. Inspect frame, wheels, brakes and tyres for signs of wear, especially cracks. It's best to clean your bike before doing this. Check for gear & brake cable stretch. Common signs include gears not shifting correctly and brakes not being as sharp as they used to be. Use the barrel adjusters on the cable housing to tighten the cables appropriately, if your bike has hydraulic brakes they may need bleeding. See the owner's manual for further brake & gear adjustment tips. Grease parts and components such as the seatpost, wheel bearings and bottom bracket bearings. This will prevent creaks and help your bike to run smoother. Please note: carbon fibre parts, components and frames require carbon gel rather than grease. Inspect drivetrain for wear; a key sign of drivetrain wear is your chain slipping while riding, especially under power. If the teeth on your chainrings and cassette are worn, it's best to replace these. We also advise using a chain wear tool to see if the chain has stretched, if so, it's best to change the chain for optimum pedalling efficiency. Replace brake and gear cables if required. This is generally needed if cables have frayed or do not move freely through the cable housing, if housing is damaged this may also need replacing. 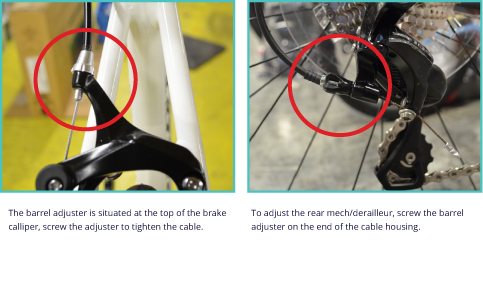 Hydraulic disc brakes often only require a bleed, inspect the brake hoses and connections to ensure no fluid is leaking, if this is the case, do not use your bike until the leaking part has been replaced. Replace bottom bracket and drivechain if excessively worn. Replace rear suspension linkage bearings and rear shock bushings if play has developed. Specialist tools such as a bearing press and bushing tool are recommended for this. We recommend cleaning your bike regularly especially after a wet and muddy ride as water and mud can cause premature wear to parts and components. If using a hosepipe never point it directly at the bearings as this can knock them out of alignment and lodge dirt in them, it's best to point the hosepipe downwards. We also recommend not to use a pressure washer as the bearings can easily be damaged.